"Some animals were born to run. 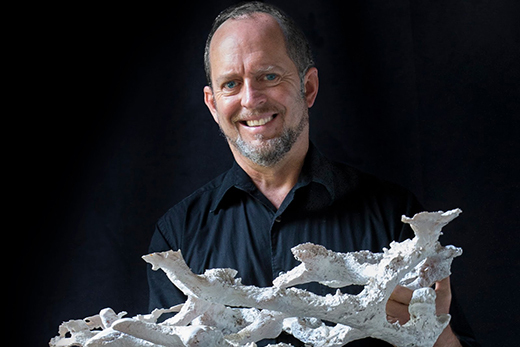 Others were born to burrow," says Emory paleontologist Anthony Martin, shown with the cast of a crustacean burrow from the Georgia coast. Photo by Lisa Streib. The dirt flies in Emory paleontologist Anthony Martin’s new tell-all book, “The Evolution Underground: Burrows, Bunkers and the Marvelous Subterranean World Beneath Our Feet.” The book takes readers on a head-spinning tour of the underworld, from the tiny tunnels drilled by modern-day earthworms to the massive, four-meter-wide paleo-burrows excavated by the Pleistocene’s giant sloths. In the following interview, he reveals some of nature’s deepest, darkest secrets. When did burrowing behaviors begin in animals? The earliest evidence we have for burrowing goes back 550 million years, with marine animals. But these early burrowers, including trilobites, didn’t go very deep. If you think of the sea floor like a carpet, they were digging into the top of it or just beneath it, probably mining the sediment for food. Around 545 million years ago, trilobites, marine worms and other invertebrates starting going deeper, burrowing vertically. They were probably both seeking organic particles for food and shelter against predators. Soon after that, predators started burrowing and the arms race was on. How did these burrowers impact the environment? By punching down into the seabed, they put oxygen down into sediment that normally wasn’t exposed to it. That started oxidizing elements on the ocean floor, changing the carbon, phosphorous, nitrogen and sulphur cycles. So burrowing changed the ocean chemistry, which in turn had an influence on atmospheric chemistry. These early burrowers were ecosystem engineers. So burrowers were the original survivalists? Yes! Burrowing enabled animals to make it through the worst that Earth threw at them – or even the worst that the solar system threw at them. A lot of animals, for example, lived after a large asteroid impact killed off the dinosaurs 66 million years ago. Why did they survive? They were in their bunkers! It’s likely there were other factors, but burrowing is definitely an advantage when you get a giant space rock dropped on you. There are modern examples, as well. After the 1980 eruption by Mount St. Helens, scientists flew over this barren, smoldering wasteland in helicopters. All the largest animals were gone. One of the only signs of life was the tops of pocket gopher burrows. Ecologists determined that pocket gophers didn’t just survive the explosion, they helped the entire ecosystem come back. They mined the soil and brought up seeds from below, restoring vegetation. And their burrows provided microhabitats for reptiles and amphibians in the area. Pocket gophers aren’t the only ecological heroes. Gopher tortoises dig burrows six-meters deep and create an underground zoo of diversity. Some 300-to-400 species live alongside the tortoises in their burrows, including indigo snakes, the longest snake native to North America, and rattlesnakes. Do any animals stand out as the best burrowers? It depends on how you define “best,” but when it comes to the amount of soil overturned, ants are the rulers of the underground. Leafcutter ants create these spiral, vertical shafts that go down two meters and branch into a labyrinth of tunnels that connect to outer chambers. A recent excavation of a leafcutter colony in Brazil showed that these tiny insects had to move about 40 tons of soil to create their underground city. That’s the ant equivalent of the Great Wall of China, in terms of the effort that went into it. And that’s just a single ant colony. Especially compared to their size, ants have a disproportionate impact on ecosystems. What about human burrowing behaviors? Humans also burrow to survive predation and environmental extremes. The massive underground cities carved out of volcanic ash in Cappadocia, Turkey, during Byzantine times served as safe havens during times of war. Fears of nuclear warfare during the Cold War prompted the U.S. military to build networks of underground bunkers. Montreal’s The Underground City was created mainly to deal with Canada’s long winters. People live, shop and go to the office while staying in a climate-controlled environment. And in the opal-mining town of Coober Pedy, in the Outback of Australia, people have adapted to the scorching heat by building underground houses. We can learn a lot from burrowers of the geologic past, as well as the burrowing animals of today. If you want to survive a mass extinction, for example, you should probably start digging.